Back in September of 2015, Avenue talked to Sylvia and Darren Cheverie, the Beaumont couple whose Kickstarter campaign for their French-Canadian restaurant Chartier quickly became the most successful restaurant Kickstarter in Canada. 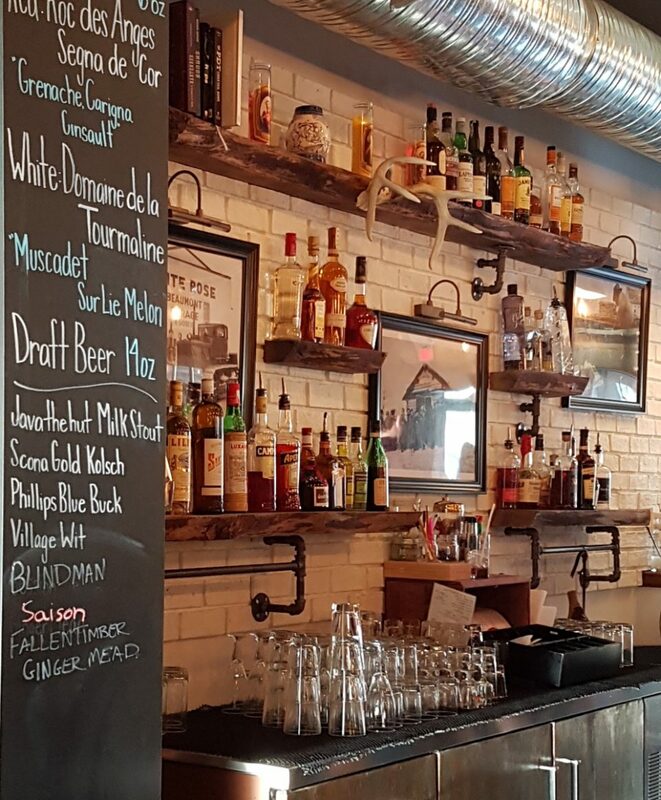 Now, the much anticipated Chartier is open on a charming main street in Beaumont, and it’s well worth the trek. Chartier has only been open a few weeks, but when I stopped by with a dining companion on a Friday evening, it was bustling. There was no way to snag a table without a reservation, but we were able to squeeze in at the end of the bar – a perfect spot to get a full view of the restaurant. A chalkboard-covered space beside the bar lists the available beers, from which my date selects a Java the Hut Milk Stout from Fernie Brewing Co. When I ask for a recommendation for a light summer drink, the bartender steers me towards the Baby Duck 75 – a cheeky take on the elegant French 75, using the sweet, fruity Baby Duck sparkling wine in place of an expensive Champagne. Gin adds a kick to the cocktail while the fresh lemon juice gives a wonderful tartness to balance out the Baby Duck’s sweetness. The open kitchen means you can see the chefs at work, and even glimpse the bread window where the restaurant allows carb lovers to purchase a few fresh baked goods. Everything in the space, from the framed chalkboards with hand-written statements to the warm wood and Edison bulbs, provides a sense of coziness. After spending several years in Montreal, I find it near impossible to pass up poutine on a menu, and sure enough, it’s Chartier’s entre poutine, the Poutine de la mer Rosenau, that catches my eye come time to order – and I’m not disappointed. It starts with a house made sourdough bread bowl, which contains a layer of smoky bacon and lobster pieces, topped with a serving of poutine. Then, as if that weren’t enough, comes the lobster bisque. The creamy broth comes served in a gravy boat alongside the dish. Initially, I timidly drizzle the dish with the chowder, but the bartender quickly comes over and shows me exactly how it’s done – enough poured overtop the dish to saturate the bread. It’s decadent and absolutely delicious. And, of course, Chartier hasn’t forgotten its Kickstarter roots. To the left of the bar, a huge black and white map takes up the entire wall – a family map, filled with the names of donors who contributed to the restaurant’s campaign. It’s a simple and striking design that drives home Chartier’s sense of community – once you walk through those doors, you’re family.